If you’re looking for ironclad evidence that LaVar Ball’s Big Baller Brand is done for, look no further than his eldest son’s right arm. 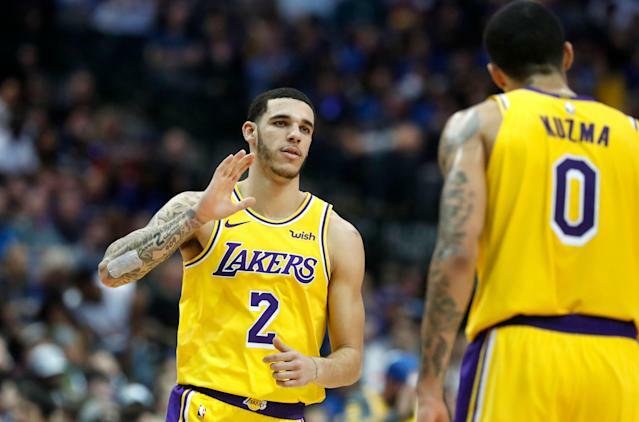 Los Angeles Lakers point guard Lonzo Ball reportedly had a tattoo of the Big Baller Brand logo on his arm covered up with a pair of very misshapen dice, per an Instagram post from The Blast. The dice are shown with the numbers 1, 2 and 3 visible, likely an homage to the numbers Ball and his brothers typically wear on the court. So at least the thought was nice. Funnily enough, Ball had to cover up the Big Baller Brand tattoo this season due to an NBA crackdown on commercial logos, which really is quite the show of force for the league’s merchandise deals. Ball removing Big Baller Brand ink from his body really isn’t a surprise if you’ve been following the demise of LaVar’s company. The brand has been flailing since it was reported that Ball cut ties with its co-founder Alan Foster. The reason why: $1.5 million that has reportedly gone missing from Ball’s personal and business accounts. Ball has since hinted at moving on from the company and joining Nike with an Instagram post featuring a Nike slogan and a caption that read “Moving on to bigger and better #MyOwnMan.” Given that Ball reportedly owns 51 percent of Big Baller Brand, that likely means bad things for the company. The Ball family has reportedly discussed folding the brand, and you can imagine that Ball’s new ink, as well as his manager posting a video of himself throwing a pair of BBB shoes down a garbage chute, is a strong indicator that at least one member of the family is going through with the plan.